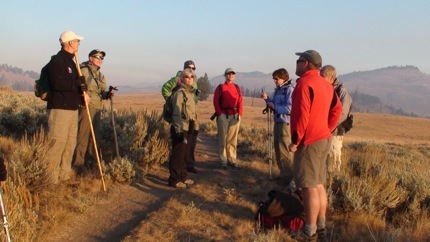 NPCA's Joe Josephson leads a group on a hike following the migration of Yellowstone's pronghorn. Photo: Beth PrattAlthough the focus of yesterday's outing was supposed to be pronghorn, the musical bugling of the rutting elk resounded throughout, and the group encountered several herds, and a few dueling bulls. Yet even with their less showy courtship ritual (primarily a male pronghorn continually herding his harem), the pronghorn did not disappoint. Participants following the footsteps of the ancient animal encountered a small group on the shoulder of Mt. Everts in Yellowstone National Park and watched in delight as the animals loped across the hillsides. The group, led by National Parks and Conservation Association (NPCA) Wildlife Fellow Joe Josephson, spent the day tracing part of the migration route of the Yellowstone pronghorn. The nomadic pronghorns that inhabit the western United States wander long distances on their annually migration—research has shown movement up to 300 miles. Yet the migration of Yellowstone’s pronghorn—numbering roughly 300—has been sharply curtailed by human development. For the pronghorn herds that inhabit the park, a historical migration that once took the animals up the river canyon to nearby Paradise Valley in Montana has now been shortened considerably. Some of the pronghorn even forgo migrating and live year-round near the north entrance and Gardiner, searching out sustenance from the sparse forage during the winter months. Climate change may also be affecting the animals as a drier climate in the west impacts foraging conditions. Josephson conducts outreach for the NPCA campaign to protect the pronghorn and is working with ranchers and landowners to remove or modify fences to help improve the animal's access through private land. Although pronghorn physiologically have difficulty jumping, they can crawl under fences designed with 18-inch openings on the bottom. Pronghorn are truly remarkable animals. Called “speed goats” by Lewis and Clark, the fleet-footed creatures can sprint across a grassy steppe at speeds of up to 60 mph. As the fastest land mammal in North America, an adult pronghorn can outrun its predators; even a newborn fawn a couple of days after its birth can run faster than a human. Pronghorn are not true antelope, despite their mention in the well-known song, "Home on the Range," under that name. Visit the NPCA website for more information about the group’s efforts to protect Yellowstone’s pronghorn. I've already hit the snooze button a dozen times...Living in Yellowstone National Park, I always scan my surroundings and remain alert for wildlife encounters. I learned this strategy the hard way, such as the morning I emerged from my house a bit sleepy, forgot to look both ways before walking out the door, and found myself face-to-face with a rather large bison grazing on my lawn. The encounter proved more effective than a shot of espresso for curing my drowsiness, and also forced me to add a "look both ways when exiting the house" rule to my routine. I will now have to add a "look up" rule as well. Last week a black bear decided to nap about 30 feet up the trunk of a tree in my yard. 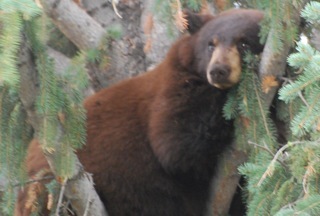 My neighbor walked her dog under the tree in the morning, unaware that right above her head was a sizable bear. The bear remained in the tree all day, occasionally awakening to shift position and yawn, looking like we all do in the morning when we resist getting up for work. People gathered in the driveway to view the slumbering ursine, and watched as the strong winds rocked the tree like a giant cradle as the bear slept peacefully. Here are some more photos of the napping bear. Sam Galindo and his father, Peter (the NPS project architect) greet the first visitors to the center (Photo by Beth Pratt)Not to be upstaged, Old Faithful surged into the blue sky during the grand opening celebration of its new namesake visitor center, causing the hundreds in attendance to turn from the proceedings and watch the spectacular eruption. The Old Faithful Visitor Education Center opened today, after almost eight years of planning and over two years of construction. Sam Galindo (the son of the National Park Service project architect) proudly waved a Yellowstone flag and led the first visitors into the building. Lewis recognized the Yellowstone Park Foundation and its donors for making the center possible. “It’s hard for us to underestimate how much the efforts of the Yellowstone Park Foundation helped us get here today. They raised $15 million—over half of the budget.” The Foundation’s board chairman, Bannus Hudson, told the crowd, “As the park’s official fundraising organization, this is the proudest day in our history.” Major donors to the project include ConocoPhillips, the National Science Foundation, Shalin Liu, Unilver, Cheng Wu, Coca-Cola Foundation, and Toyota Motor Sales, USA, among others. And as if on cue, Old Faithful erupted soon after his remark. In Yellowstone this year, bears have received much attention, from the grizzly sow that gave birth to a rare four cubs, to the recent attacks outside the park. I spoke this week with Kerry Gunther, National Park Service Bear Management Biologist in Yellowstone, for an ursine update. How are the bears overall in Yellowstone doing? We had good cub production in the park this year and cub production significantly exceeded human-caused bear mortality, so bears in Yellowstone National Park have been doing fairly well so far this year. One of the highlights this year for park visitors has been viewing the grizzly sow that gave birth to a rare four cubs. How are the bear and her four cubs doing? Are all the cubs still alive? The female with the four cubs was observed earlier this week. She and all four cubs are doing well so far. What is the likelihood that all four bear cubs will survive? The probability of a grizzly bear cub surviving its first year is about sixty-four percent. Very few bears die during hibernation, so if they make it to denning they have a high chance of surviving to their yearling year. They have beaten the odds so far. At least anecdotally, this appears to be a great year for bear sightings in the park. Statistically has there been an actual increase in activity? If so, any reason for the increased bear sightings? So far, we have not really had significantly more bear sightings than last year. Because whitebark pine trees did not produce many cones this year, we expect to have more late summer and fall sightings than last year because bears will likely be down at lower elevations eating roots and other foods. Last year the whitebark pine seed production was very good and so bears were up high in the forest during late summer and fall and thus less visible. There have been many reports on the relationship between grizzly bears and the whitebark pine decline, most citing that the demise of the tree will have pretty significant consequences for the bears. Do you agree? Bears are very adaptable, omnivore generalists that are capable of diet switching. They have adapted to the loss of whitebark pine in other ecosystems. In some years, the whitebark pine trees in the GYE don’t produce many cones, and bears have switched to other fall foods those years. We don't know exactly how the complete loss of whitebark pine may affect bears. Tree mortality appears to be lower this year. So hopefully the worst of the mountain pine beetle mortality of whitebark pine is now behind us. There have been two bear attacks in the Greater Yellowstone Area recently (although none in the park). Is this unusual? Do you think the bears are especially stressed this year? Nutritional stress may have been a contributing factor in the bear attacks at the Soda Butte Campground outside of Cooke City. The attack in the Kitty Creek drainage on the Shoshone National Forest was not likely related to food stress in any way. Do you have any ideas what caused the recent attack at Soda Butte? Wildlife officials have said this isn't typical bear behavior. 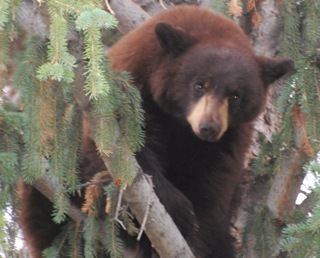 We have no way of knowing for sure why the bear attacked the campers at the Soda Butte Campground. Bears are predators and although it’s extremely rare, they do sometimes prey on people. Beth with Vice President BidenLast year I was fortunate enough to see President Obama when he visited Yellowstone National Park. Today, I was lucky enough to meet Vice President Biden during his trip. Biden was touring Yellowstone and the Grand Canyon to showcase the stimulus projects being funded in national parks as part of the Recovery Act. He was almost upstaged by a bull moose who wandered into the Madison River Canyon right before his talk--moose sightings are rare in the area, but the moose politely exited from view before Biden arrived. Although I am a big supporter of the stimulus funding in the parks, and was eager to hear his message on the topic, I most appreciated when the Vice President deviated from the topic and went off script with a personal story. He told about his trip to Yellowstone with his two sons not long after the car crash that killed his wife and daughters. Yellowstone had helped them heal, he conveyed to us, and I related to his sentiment. Yosemite, Yellowstone--parks had always helped me heal. The video below captures him relating this story. For a more formal report on the Vice President's visit, you can read my Examiner article. Two curious grizzly bear cubs gaze at onlookers in Yellowstone (Photo by Beth Pratt)Wolves usually rank as the “rock stars” of the wildlife world in Yellowstone, but this year the undisputed animal celebrities are a grizzly and her four cubs. Grizzly bear sightings are common in the park, but this rare ursine family has been spotted almost daily in the vicinity of Swan Lake Flat, just south of Mammoth Hot Springs. Today the mother and her large family rewarded early morning wildlife watchers by making an excursion in close proximity to the road. Visitors could clearly view the cubs playing and climbing on their mother without using a spotting scope or binoculars. Most grizzly bears give birth to one or two cubs, with an occasionally set of triplets appearing as well. Four cubs in one litter is a rarity. Although not all four offspring are expected to survive, all cubs appeared active and well this morning. Newborn elk calf at Mammoth Hot Springs Hotel, Yellowstone (Photo by Beth Pratt)Spring brings spectacular wildlife watching opportunities in Yellowstone—especially since animals are giving birth to adorable offspring throughout the park. Today, guests at the Mammoth Hot Springs Hotel witnessed the birth of an elk calf on the property’s grounds. Some onlookers continued to watch the calf and its mother for hours, and many clapped when the newborn took its first steps. As a protection against predators, elk calves can walk an hour after being born. Just a few miles south of Mammoth Hot Springs, people continue to gather in Swan Lake Flat to view a grizzly bear and her four cubs as they wander in the open meadows and hillsides. Most grizzly bears give birth to 1-2 cubs, with an occasional set of triplets occurring, but a grizzly with four cubs is a rarity. The runt of the litter has been spotted frequently hitching a ride on his mother’s back. And yesterday afternoon a herd of bighorn sheep delighted visitors in the Gardner Canyon by frolicking with their baby lambs on cliffs near the roadside. One curious lamb seemed to pose for the photographers as it stood upright on a rocky ledge. Within two weeks of their birth, bighorn lambs are able to run with adults to escape danger. For guided wildlife watching trips in Yellowstone, contact Yellowstone National Park Lodges or the non-profit Yellowstone Association. View an assortment of “baby” portraits of some of Yellowstone’s wildlife below. Grizzly bears often give birth to one or two cubs, and occasionally have three offspring. This year, visitors have flocked to an area just outside Mammoth Hot Springs in Yellowstone National Park to witness a rarity: four adorable bear cubs parading behind their mother. The bear family has been spotted almost daily in the area near Bunsen Peak and Swan Lake Flat, with the four cubs frolicking and playing in the vicinity of their mother. A grizzly sow gives birth to a litter of cubs during hibernation in January or February, and the cubs usually remain with her for two winters after birth. Yesterday this remarkable bear family spent the morning wandering in the meadows of Swan Lake Flat and hundreds of visitors watched the playful antics of the cubs. Unfortunately, not all of the cubs are expected to survive, and one of the four appears much smaller than its siblings. Yellowstone is home to over 150 grizzly bears who reside permanently in the park, and the Greater Yellowstone Ecosystem houses over 600 of the animals. Black bears also live in Yellowstone National Park and are commonly sighted as well. The Yellowstone grizzly bear was recently placed back on the endangered species in 2009 as climate change is having an impact on an important food source for the animal—the whitebark pine nut. Yellowstone’s grizzlies called attention to their plight in an amusing protest video directed at Stephen Colbert. My friend Michelle is my guru in all things food and fashion (she managed to wean me off scrunchies and athletic socks). We have traveled together for business and for pleasure frequently, and I always let her select the restaurant. From the yummy Guinness marinated mussels at Bertha's in Baltimore, to the exquisite sushi at Sushi Den in Denver, to the delicious oysters at the King's Fish House in San Diego, she has never lead my astray with food. And now you can also profit from her cuisine and travel related wisdom as she's just unveiled her new blog: Junket. The blog contains great photos (the food related ones will make you hungry! ), witty stories and a personalized rating system. Check out her new photos of her recent hike on Yosemite's Mist Trail that she just posted. Yellowstone's boreal chorus frog inspires research on vaccine transport (Photo courtesy Georgia Tech)What do frogs and vaccine transportation have in common? Or bighorn sheep and automobile safety? Professor Jeannette Yen, Director of the Center for Biologically Inspired Design at Georgia Tech, described the relationships between these seemingly unrelated things during a presentation today in Yellowstone National Park. “Imagine what Yellowstone can inspire,” Yen told the audience. She teaches a course on biologically inspired design and this spring tasked her freshman class in developing innovative products and techniques based on Yellowstone’s unique living world—one of the largest intact wild ecosystems on earth. “Yellowstone has such a richness of organisms and a range of challenges—like extreme cold or thermal activity—that all animals and plants address successfully. The diversity of this place has blown me away,” said Yen. Life in the first national park has already been the impetus for a number of research and design projects. For example, the intrepid Boreal chorus frog survives Yellowstone’s harsh winters in a frozen hibernation. To accomplish this, the animal raises its blood sugar levels to prevent tissue damage—the water outside the tissues freeze, the water inside the tissues is protected by the blood sugar “antifreeze.” Scientists are studying this amazing process to improve techniques for transporting and preserving vaccines. During their annual rut, bighorn sheep engage in horn-to-horn combat as they establish dominance. Some of these contests can last up to 24 hours and the animals can collide at speeds of over 40 mph. The honeycomb structure of its horn base and its perfectly aligned spine create a highly effective shock system that helps it resist injury. This natural system is helping researchers design better collision resistant material for automobiles. Yellowstone visitors enjoyed frequent sightings of grizzly bears this week (Photo by Beth Pratt)John Muir wrote, "A thousand Yellowstone wonders are calling, 'Look up and down and round about you!'" Springtime in Yellowstone brings an array of wonders like the sight of a bison calf nursing or a mighty grizzly bear scrounging for food. This past week, wolves made regular excursions to snack on a carcass at a roadside location near the Gardner River and attracted daily crowds. A grizzly bear and bison tussled on the Grand Loop Road in front of dozens of people. Adorable newborn bison calves, with their distinct orange coats, trotted alongside their mothers to the delight of park visitors. A black wolf scouted an elk carcass lying in the Gibbon River. And a few people reported sightings of a grizzly bear with four cubs wandering in the Swan Lake Flats area. Despite numerous snowstorms in the park this past week, Yellowstone offered spectacular wildlife watching opportunities to visitors braving the snowy, spring weather. Wildlife experience their own spring fever, some giving birth to offspring and gorging on food after a long, hungry winter. For wildlife lovers, May and early June are excellent times for experiencing frequent animal encounters in the park. When visiting Yellowstone, check at any open park visitor center or at the non-profit Yellowstone Association’s new Gardiner Arch Store for an updated listing of wildlife sightings. For information on traveling to Yellowstone, visit the National Park Service website. Information on lodging and services can be found online at Yellowstone National Park Lodges. For a great wildlife watching experience, consider taking a tour with a park guide. Both the non-profit Yellowstone Association or Yellowstone National Park Lodges offer a variety of wildlife tours. Pronghorn in Yellowstone's northern range on March 10, 2010 (photo by Beth Pratt)One of the delightful rites of spring in Yellowstone National Park is the annual gathering of pronghorn at the park’s north entrance. Every year a herd of pronghorn rendezvous in the meadows and hills near the famed Roosevelt Arch as they move to their summer range. For the pronghorn herds that inhabit the park, a historical migration that once took the animals up the river canyon to nearby Paradise Valley in Montana has now been shortened considerably. Some of the pronghorn even forgo migrating and live year-round near the north entrance and Gardiner, searching out sustenance from the sparse forage during the winter months. Pronghorn are truly remarkable animals. Called “speed goats” by Lewis and Clark, the fleet-footed creatures can sprint across a grassy steppe at speeds of up to 60 mph. As the fastest land mammal in North America, an adult pronghorn can outrun its predators; even a newborn fawn a couple of days after its birth can run faster than a human. Pronghorn are not true antelope, despite their mention in the well-known song, "Home on th Range," under that name. Another spring arrival who Yellowstone locals enjoy greeting is a solitary pronghorn buck, alternatively nicknamed Peanut, Solo, or Andy by residents. In the spring and summer months he can often be seen grazing or napping contently in the grasslands and hillsides near Roosevelt Arch or on the lawns of some of the park’s historic structures outside of Gardiner. Viewing pronghorn in Yellowstone: Pronghorn can be seen year-round at the park’s northern entrance, but are most noticeable during early spring on the Rescue Creek Trail and Old Gardner Road. In summer, the animals are often spotted in Lamar Valley as well. Yellowstone's frogs in new airport PSA (image courtesy Save the Frogs)Next time you frequent the airports in Denver, Chicago, St. Louis or Detroit, you might see a Yellowstone Columbia spotted frog peering at you from a colorful poster. Save the Frogs, a non-profit dedicated to amphibian conservation, has launched a new public service campaign about the plight of the first national park’s amphibians. Frog populations have been declining worldwide at unprecedented rates, and nearly one-third of the world’s over 6,000 amphibian species are threatened with extinction. Up to 200 species have completely disappeared since 1980, while amphibians naturally go extinct at a rate of only about one species every 250 years. In Yellowstone, a recent study found that three of the four species of the park’s amphibians had decreased as a result of climate change. Researchers surveyed kettle ponds (ponds originally formed when glaciers retreated and fed by snowmelt and groundwater) between 2006 and 2008 in Yellowstone's Lamar Valley. They discovered that dry ponds have increased 4-fold in the past sixteen years, and as a result eliminated a large segment of ideal amphibian habitat in the park. Dr. Kerry Kriger, founder and Executive Director of Save the Frogs, visited Yellowstone last year and gave a talk to park visitors about amphibian decline. He got the idea for the PSAs and approached ClearChannel about placement in airports; the company agreed to help. Save the Frogs is also holding its second annual Save the Frogs Day on April 30, 2010. Events are being planned throughout the United States, South Africa, India, Australia, Croatia, Italy, the United Kingdom, and Colombia. For more information, or to participate in the event, visit the Save the Frogs website. Earth Hour 2009 supporters in Thailand (Photo courtesy WWF)The news about climate change is often bad, filled with disheartening updates and sobering predictions on current and future impacts to our planet. But on March 27, 2010 at 8:30 pm the world will celebrate life on earth and unite in the battle against climate change as the lights go dark globally as part of Earth Hour. Sponsored by the World Wildlife Fund, Earth Hour has been an annual event since 2007. Last year, 4,159 cities participated including New York, Hong Kong, Paris, London, Sydney, and Los Angeles. Over a thousand iconic landmarks also went dark such as the Eiffel Tower, the Empire State Building, Rome’s Coliseum, and the Las Vegas Strip. In December of 2009 at the historic UN Climate Conference in Copenhagen, over 192 nations unanimously agreed that global warming is the greatest threat to our planet today and that the world must act together to limit warming to a 2-degree threshold. The consequences of our reliance on fossil fuels and overwhelming consumption of energy is reverberating across the globe—disrupting natural processes and placing people and animals at risk. Climate change is impacting the life on earth that we cherish—today. It is not an abstract, future threat, but a real force that already has repercussions in the present. In Yellowstone National Park, a small beetle that thrives in warmer temperatures is destroying a vital food source for the park’s grizzly bears. Over a third of the world amphibians are on the verge of extinction, including the yellow-legged frog in Yosemite National Park. Desert bighorn sheep and American pika, already living in two different worlds of extremes, are disappearing from their historical ranges as increasing temperatures render their respective habitats unsuitable. Pledge your support for the grizzly bear, for the yellow-legged frog, the pika, for the survival of our national parks, and for all life by taking part in Earth Hour on March 27, 2010. The Roosevelt Arch at the entrance to Yellowstone National Park (photo by Beth Pratt)The official birth of Yellowstone—and what has been deemed "America’s best idea"—occurred on March 1, 1872 when President Ulysses S. Grant signed a bill that designated Yellowstone as the world’s first national park. Current and future generations should be eternally grateful to the pen strokes of President Grant on March 1, 1872. For over 130 years, the magnificent landscapes and cultural heritages of our national parks have inspired countless people. And numerous countries have emulated the national park model—the founding principles behind “America’s best idea” continue to reverberate across the globe. Today, the national park system protects an array of natural and cultural treasures in 392 sites that encompass 84 million acres of land and 4 million acres of oceans and other waters. Almost 275 million people tour the parks annually, ranging from the largest at Wrangell-St. Elias National Park and Preserve, in Alaska (13.2 million acres), to the smallest at Thaddeus Kosciuszko National Memorialin Pennsylvania (0.02 acres). Celebrate the birthday of Yellowstone—and of America’s best idea—by visiting a park today. Visit the official website of the National Park Service for more information. If you can’t visit, you can connect with your favorite park via webcam. Jonathan Jarvis speaking at the APPL conference in San Diego (Photo by Beth Pratt)Jonathan Jarvis was confirmed as the Director of the National Park Service in September of 2009. A 30-year veteran of the National Park Service (NPS), he has served as regional director of the agency’s Pacific West Region, and as superintendent of Mount Rainier National Park in Ashford, Washington, Craters of the Moon National Monument in Idaho, and Wrangell-St. Elias National Park & Preserve in Alaska. During the Association of Partners for Public Lands conference yesterday, Jarvis updated a standing-room only audience about the latest issues facing the NPS, from climate change to firearms in parks. In our interview, he elaborated on some of his priorities for the agency. You have called climate change one of the greatest challenges the National Park Service has ever faced. How do you see the service addressing this issue? The NPS has a unique responsibility with climate change in protecting the special places we have been entrusted to care for. So much of the climate change issue is framed in terms of green energy and carbon sequestration, but we also have to deal with the preservation aspect. We fulfill many significant roles in the fight against climate change. Our lands straddle large ecological systems—such as the Sierra Nevada and Greater Yellowstone Ecosystem—in some of the most extreme and sensitive environments in the country. These places provide areas for important scientific studies regarding global warming. Education is also a crucial role for the NPS. Climate change can be a difficult concept to teach—for example most people do not differentiate between climate and weather. The parks have the advantage of being able to reach large numbers of people—most of whom are not only repeat visitors but also multigenerational ones. They are already seeing the changes in the parks they love; we can help promote stewardship by making the connection between climate change and these impacts. Our most important role in climate change, however, is providing optimism and hope about the future. So much of the news about climate change is very depressing. The NPS manages an incredible diversity of sites in America, some of them representing our history in times of crisis; these sites offer lessons in the positive change that emerges from challenging events. We should provide centers of hope on the climate change issue as well. President Obama just signed an executive order that sets sustainability goals for federal agencies with greenhouse gas emission reduction targets. How will the NPS approach these goals? One of the top priorities on my agenda is that the NPS and its all partners—contractors, concessioners, non-profits—infuse sustainable practices throughout their operations in a comprehensive manner. We need to insist that practices like LEED (Leadership in Energy and Environmental Design) building, energy efficient lighting, and extensive recycling programs become standard across all parks. We should be setting the example to our visitors with our sustainable practices, which is another educational tool in the climate change forum. One specific initiative we’ve been exploring is working with the LEED model and developing a similar criteria that incorporates the special circumstances of historic structures. Historic structures hold a large amount of embedded energy—we believe we can both do good in terms of the environment and maintain the historic integrity of some of our buildings. What are some other priority areas on your agenda as the new director? I have too many priorities to count, but I have developed four categories of strategic focus to make better sense of the enormous task we have before us: workforce, education, relevancy, and stewardship. In the workforce area, we’re looking at the bigger picture of the staff in parks and better incorporating the agency with our concessioners and partners. For stewardship, my goal is to be vigilant about standing up for the resource, even if it means making hard decisions. We are strengthening our educational resources and just hired a new position for the agency, an Associate Director for Education. Critical to all of our efforts is making parks more relevant to the American people—we need to reach new audiences and expand our connections to the broader population to ensure the survival of the parks. How do partners like APPL and its member organizations fit with your goals for the future? Our agency at times has made it hard to be a partner. That is going to change. We’re all in this together—working for the common goal of protecting our national parks—and as an agency we should be utilizing all of the tremendous resources our partners provide to us. Doug Smith, Yellowstone Wolf Project Leader, with wolf 472F (photo by NPS Wolf Project)Biologist Douglas Smith has led the Yellowstone Wolf Project since its inception and has studied wolves for almost thirty years. He co-authored with Gary Ferguson the book Decade of the Wolf, which details the historic wolf reintroduction effort in Yellowstone. I spoke with Douglas on January 20, 2010. Click here to view a photo slideshow of Yellowstone's wolves. You’re in the middle of conducting your winter research on the wolves in Yellowstone. What are you finding for 2009 results? We experienced a population decrease, which is the first time we’ve had two consecutive years of a decline. Since the reintroduction in 1995, the population decreased only four times: in 1999, 2005, 2008, and 2009. This year we counted between 96-98 wolves—the population has not dipped below 100 since 1999. We had to hyphenate the count for the first time because we’ve lost radio tracking with two packs, Delta and Belcher, on the southeast and southwest areas of the park. Where have the decreases in population taken place? For research purposes, we’ve started to divide up the wolves into two segments: the northern range and the interior. Our team counted 40 wolves in the northern range as compared to 56 in 2008—this is where we’ve experienced most of our population loss. The interior packs are largely stable—they decreased this year to 56-58 from the mid-60s in 2008. Overall, however, the numbers represent that we’ve lost almost half of our wolves in two years. What do you think is the reason for the decline? What is new and significant is that for the first time in our study, we think the decline isn’t associated with disease, but with food stress. During our field time, we found a wolf that had starved to death—this happens pretty rarely. We also observed multiple signs of malnutrition. We’re not alarmed about the losses or the cause because we’re beginning to think that the wolf population is developing a stable equilibrium with the available food in the park. In 1995 when they were reintroduced, this was the best place in the world to have wolves due to the abundance of food. Using the peak wolf population of 174 in 2003 as a baseline isn’t a good measure because it doesn’t reflect that the wolves probably had an inflated food source. Now we think they are finally coming into balance with the food supply for Yellowstone. The elk population in Yellowstone has also experienced a decline, which most people attribute to the wolf reintroduction. Is this accurate? The park has lost half of its elk population—but it’s not all attributable to wolves. What I like to stress is that having fewer elk is not a bad thing. We had one of the densest elk populations in the world. By bringing that population back into the proper balance, we’ve allowed other life forms in the park to flourish. Should the wolves be protected under the Endangered Species Act? The wolves have biologically recovered and should be delisted. But they have not politically recovered and people can’t agree on how to manage them. You can’t talk about wolves without talking about anti-wolf sentiment. It appears that when you can hunt wolves, you reduce the level of animosity toward them. In the end wolves are better served from taking them off the endangered species list. It’s a form of conflict management and a benefit to wolf conservation overall. What pack stood out this year in your research? Mollie’s pack has become very successful at killing bison—no easy task even for a wolf. 495M, the largest wolf ever recorded in Yellowstone at 143 pounds, leads the pack. Usually the packs will start hunting bison in mid-to-late winter, but Mollie’s started right out of the gate. Mollie’s pack also appears to have bounced back from a mange outbreak—a great new development since most wolves usually don’t recover. You lost one of your most famous wolves this year—302. There have been reports that the wolves are harder to spot in Lamar Valley these days. Is that true? Lamar provided a hub for the Druids, who are now in bad shape: only two wolves in the pack are without mange, they lost their alpha female, and their alpha male is on the way out. Some good places to see wolves are at the west end of Lamar by Slough Creek or Little America—the Lava pack of three wolves seems to be hanging out there. The Agate pack travels around Specimen Ridge, and the Quadrant pack has been sighted near Swan Lake Flats and in Mammoth Hot Springs. Today you could hear the pack howling right in our offices in Mammoth. What will be the focus for the Yellowstone Wolf Project in 2010? Our research continues to be a source worldwide for the study of predator/prey relationships, and also one of the best resources about a wolf population unexploited by human behavior. Genetics is another key area of focus. We’re doing some groundbreaking work in looking at the genetics of wolf societies and its relationship to their behavior. What I find so unique and important about the wolf project is its longevity. I recently read that 80% of wildlife research has a duration of three years or less. We’re in our 16th year. We tend to get caught up in the complexities of the web of life, but sometimes the simple things provide so much information. For us, being here in the park and watching the wolves day after day has been invaluable to our work. For more information on the Yellowstone Wolf Project visit the websites of the National Park Service and Greater Yellowstone Science Learning Center. The Yellowstone Wolf Project needs your support. Consider making a donation to the Yellowstone Park Foundation today to help fund their important work. To observe wolves in Yellowstone, take a field class with the non-profit Yellowstone Association or book a wildlife watching vacation package with Yellowstone National Park Lodges.